The heraldic family trees on the ceiling of the Long Gallery in the Moat House, Tamworth [See Comberford 5: Recusants, royal guests and civil war], illustrate the importance William Comberford and his family attached to their descent from the Beaumont family, through which they inherited their estates in Wednesbury. 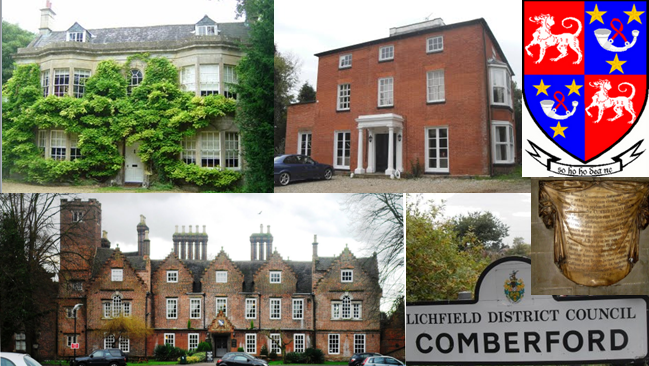 Through the marriage of Humphrey Comberford and Dorothy Beaumont, the Comberford family acquired an interest in the Wednesbury estates. However, Dorothy was one of three daughters and co-heiresses, and her other two sisters had married brothers from the Babington family. 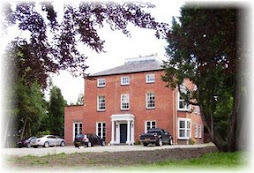 By acquiring the interests of the Babington family, the Comberfords arrested the possibility that the estates would be divided, and placed themselves in a position to exploit the new-found wealth in coal mining in south Staffordshire. The marriage also strengthened the links between the Comberford family and many of the prominent Catholic families in south Staffordshire. 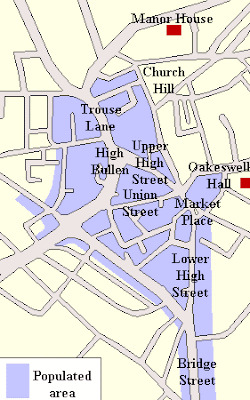 These links, and the safe passage of Catholic priests during the reign of Elizabeth I, were facilitated, in part, by the fact that the Moat House in Tamworth and the Comberford manor in Wednesbury were linked directly by the River Tame. 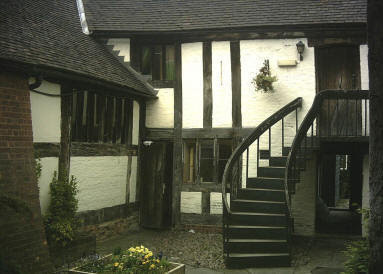 In addition, by emphasising their descent from the Beaumont family, later generations in the Comberford family claimed a certain social cachet, claiming kinship with French, Scottish and English royalty, and, perhaps, securing a prominent place during the visit of James I and his son Prince Charles to Tamworth in August 1619, when the Prince of Wales stayed overnight at the Moat House as a guest of William Comberford. 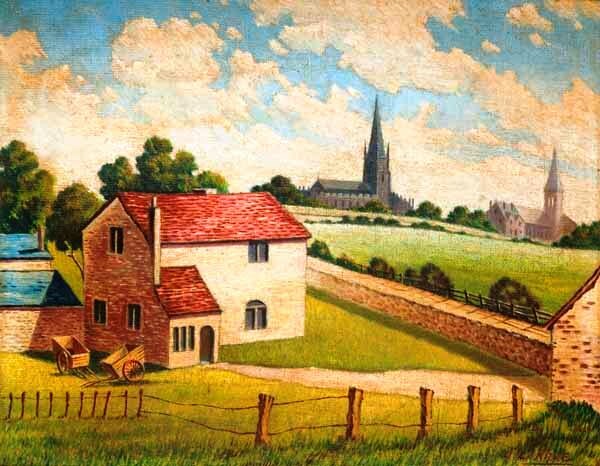 The Comberfords had risen from the ranks of the local farming families to claiming a place among the gentry. If they ever entertained any hopes of receiving a title, these never materialised, but when the prince succeeded to the throne as Charles I, he built on these claims to his own benefit, using William Comberford to raise loans and troops for the royalist cause during the English Civil War. 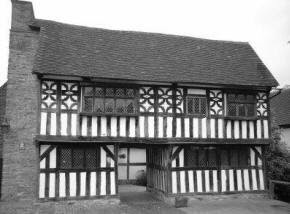 Wednesbury Manor House, which once stood on a site about a quarter of a mile north-east of Saint Bartholomew’s Church, was inherited by the Comberford family in the 16th century through the marriage of Dorothy Beaumont and Humphey Comberford. The Beaumont family, who claimed French royal ancestry, inherited Wednesbury through the marriage of Joan Heronville and Sir Henry Beaumont, while the Heronville family had acquired the estate a generation earlier through the marriage of Henry Heronville and Joan Leventhorpe. According to the local historian, William Hackwood, who lived at Comberford Cottage in Bridge Street, Wednesbury, Colonel William Comberford probably sold Wednesbury Manor in 1642 to raise money for the Royalist cause [See Comberford 5: Recusants, royal guests and civil war ]. It first passed to a Parliamentarian named Gilpin. Between 1657 and 1663 the manor was sold to John Shelton of West Bromwich, a Cromwellian and strict Presbyterian. Shelton had already bought property in the Wednesbury area from John Comberford of Handsworth. Shelton was Sheriff of Staffordshire in 1672. 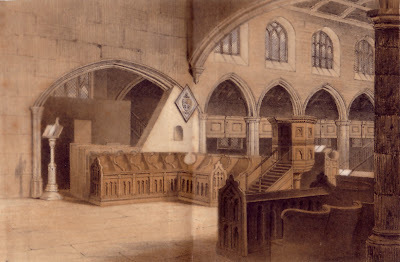 When Thomas Hoo, Lord of the Manors of Great Barr and Wednesbury, died a bachelor and intestate in 1791, the manors passed through the female line to his second cousin, Mary Whitby, wife of Edward Whitby, only daughter of the Revd John Dolman, Rector of Aldridge, and grand-daughter of William Beady and Margaret Hoo, daughter of John Hoo of Bradley, and to her first cousin once removed, Elizabeth Maria Foley Hodgetts, wife of the Hon Edward Foley (1747-1808), daughter of John Hodgetts (d. 1783) and grand-daughter of John Hodgetts of Shutt End, Kingswinford, and his wife, Mary Hoo. These two women were “the present ladies of the manor” at the end of the 18th century. Wednesbury then passed to Sir Joseph Scott (1752-1828), when he married Margaret Whitby, the only daughter of Edward and Mary Whitby and one of the two Hoo heiresses. A local vicar, the Revd John Wylde, contested this succession and produced a will dated 1777 naming himself as the chief beneficiary. When the case was heard at Stafford Assizes in 1792, a papermaker proved beyond doubt that the will produced by Wylde was a fake and was on paper made after Thomas Hoo’s death. Scott inherited Wednesbury Hall and was made a baronet in 1806. He was still in possession of Wednesbury Hall in 1820, and died on 17 June 1828. His son, Sir Edward Dolman Scott (1793-1851), was MP for Lichfield. The coal-mining interests of the Comberford and Parkes families passed in the 17th century to the daughters of Richard Parkes of Old Park. In 1727, Sarah married Sampson Lloyd, a leading Quaker whose descendants gave their name to Lloyds Bank. Sarah’s sister married Thomas Pemberton, whose descendants also married into the Lloyd family. Wednesbury Hall was later known as Mason’s Hall, and the manor house was in slum conditions by the mid-19th century. It was only the size of a cottage when it was photographed in 1894, and it was completely demolished at the beginning of the 20th century. 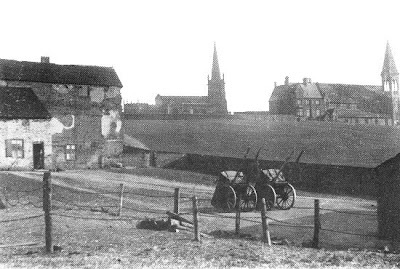 The site of the original manor house at Wednesbury is not known. In William Comberford’s time, the manor house lay about 300 metres north-east of Saint Bartholomew’s Church, by Manor House Road, close to today’s primary school and Beaumont Road, although in the early 1970s, the site of the original manor house of Wednesbury Hall was pointed out to me as a Midlands Electricity sub-station between Nos 98 and 100 Manor House Road, near the corner of Harcourt Road and Beaumont Road. Manor House Road is part of the B4200 linking Wednesbury and Darlston. However, the name of the Manor House has also been used since the 1960s by a public house on Hall Green Road, Wednesbury. The Manor House is a magnificent timber beamed property dating back to 1230 and was extended and added to during the 15th and 16th centuries. Surrounded by a moat, thought to be date from the original building, this house remained a private residence until the 1880s, when it was concealed behind modern brickwork and split into flats. Tragically, it was run down and derelict by the 1950s. However on clearing local slums, the original building was discovered and thankfully restored to its former glory. It has been a pub and restaurant since the 1960s, although it was temporarily closed in late 2009. Shaw 2, p. 84; Erdeswick, pp 291-294. Erdeswick, p. 294; Shaw 2, p. 84. Erdeswick, p. 294; Shaw 2, p. 105; Hackwood, p. 163. Erdeswick, p. 294; Shaw 2, p. 84; Hackwood, p. 163; J.N. Bagnall, A History of Wednesbury (1854), pp 11-12; Burke’s Peerage, various eds, s.v. Scott (1806), Foley and Montrose; Bernard Burke, Landed Gentry (1863 ed. ), s.v. Whitby, vol 2, p. 1650. Shaw 2, p. 294; William White, History, Gazetteer and Directory of Staffordshire (Sheffield, 1834), p. 450; Bagnall, pp 11-12; VCH Staffs 12 (1976). Patrick Comerford, visits to Wednesbury 1971-1972. Last updated: 3 April 2008; 4 June 2009; 15 August 2009; 9 November 2009; 16 July 2010; 26 and 31 December 2010; 26 April 2011; 21 May 2011; 30 May 2012; 23 May 2014; 27 July 2016.